Russ Temperley was born on April 3, 1935, in Massachusetts. 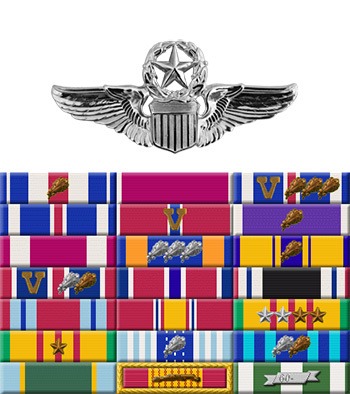 He was commissioned a 2d Lt in the U.S. Air Force through the Air Force ROTC program on May 31, 1957, and went on active duty beginning April 22, 1958. Lt Temperley next completed pilot training and was awarded his pilot wings at Craig AFB, Alabama, in July 1959, followed by B-47 Stratojet Combat Crew Training from July to November 1959. His first assignment was as a B-47 pilot with the 419th Bomb Squadron at Lockbourne AFB, Ohio, from December 1959 to November 1961, followed by service as a B-47 pilot with the 32nd Bomb Squadron at Lockbourne from November 1961 to June 1964. Capt Temperley served as an EB-47L pilot with the 4365th Post Attack Command and Control Squadron at Plattsburgh AFB, New York, from June to December 1964, and as a B-47 pilot with the 529th and 528th Bomb Squadrons at Plattsburgh from December 1964 to November 1965. He next completed C-141 Starlifter transition training in January 1966, followed by service as a C-141 pilot with the 9th and then 20th Military Airlift Squadrons at Dover AFB, Delaware, from February to November 1966. Capt Temperley then attended F-105 Thunderchief Combat Crew Training from November 1966 to May 1967, and served as an F-105 pilot with the 469th Tactical Fighter Squadron at Korat Royal Thai AFB, Thailand, from July 1967 until he was forced to eject over North Vietnam and was taken as a Prisoner of War on October 27, 1967. After spending 1,966 days in captivity, Maj Temperley was released during Operation Homecoming on March 14, 1973. He was briefly hospitalized to recover from his injuries at Westover AFB, Massachusetts, and then attended Pilot Requalification Training and Pilot Instructor Training with the 560th Flying Training Squadron at Randolph AFB, Texas, from October 1973 to June 1974. 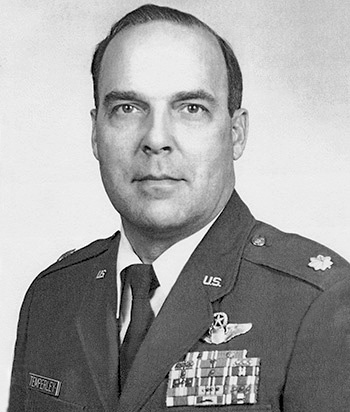 After serving as an instructor pilot, Lt Col Temperley served as Chief of the Airfield Management Branch and then as Chief of the Operations and Training Division with the 2750th Air Base Wing with Air Force Logistics Command at Wright-Patterson AFB, Ohio, from July 1978 until his retirement from the Air Force on May 1, 1986. Russ Temperley died on October 15, 2005. Captain Russell E. Temperley distinguished himself by gallantry in connection with military operations against an opposing armed force over North Vietnam on 3 October 1967. On that date, Captain Temperley was a member of a flight of F-105 Thunderchiefs assigned to attack a target deep in hostile territory. When the lead aircraft in his flight was shot down he circled the area, giving cover for his downed comrade. During the rescue operation he braved four separate attacks by surface to air missiles, heavy antiaircraft fire, and harassing hostile aircraft to remain in the area as cover. By his gallantry and devotion to duty, Captain Temperley has reflected great credit upon himself and the United States Air Force.